Last December, I visited Phu Quoc Island for a few days. Located in the Gulf of Thailand, south of the mainland Vietnam, the island is the largest in Vietnam, measuring 31 mi (50 km) long and 16 mi (25 km) wide. 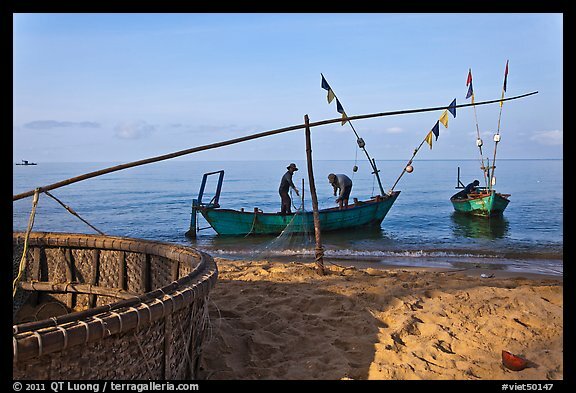 It is famous through Vietnam for its fishing industry, and in particular fish sauce, however the increasing attraction nowadays resides in its long beaches, many of them remain free of any development, except for a few fishermen’s huts. The flight from Ho Chi Minh city took only about one hour ($100 one-way), landing very close to the center of the main town, Duong Dong. In order to get around the island autonomously, I rented a motorcycle. While I would never dare to drive in the positively crazy traffic of Ho Chi Minh city, Phu Quoc Island appeared relaxed, as one would expect from a remote tropical island. As I hadn’t ridden a motorcycle in more than a decade (previous time was also in Vietnam ! ), the first moments after taking delivery of the bike were difficult, but afterwards I had no trouble. Then I decided to try and visit one of the famed fish sauce factories. 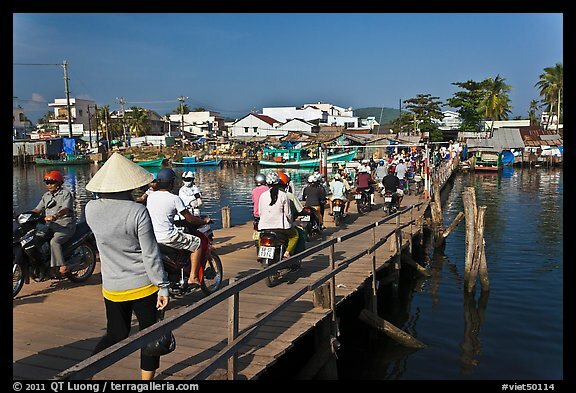 I noticed that the most direct route from my hotel involved crossing a rudimentary mobile bridge, then the public market. The bridge was quite crowed, but by taking it slowly I was able to manage. What I was not able to manage, though, was to ride through the public market, which turned out to be packed shoulder-to-shoulder. I got down the bike and tried to push it through, but with the crowds (and the weight of the bike), this too, proved problematic. By now, trying to turn the bike around to get to a less crowded spot, I was feeling seriously stressed. Just as I parked the bike near the market entrance, I was told this wasn’t a suitable spot. I looked frantically into my pants multiple pockets for the bike’s key. Left front pocket, right front pocket, back left pocket, back right pocket: nowhere to be found. What to do ? A motobike driver, who had been observing this clumsy, foreign-looking fellow, told me to go and see the locksmith, whose shop was just across the corner. The man informed me that he could make a new key on the spot, but that this would be expensive, as this is a difficult job. How much ? About US $4. I told him to proceed, quite skeptical that he would be able to cut such a complicated key without having the original to copy. He used just two tools, a metal wire, and a hand file. I was about to get a good lesson in Vietnamese ingenuity. I watched him with increasing fascination as he worked quickly and surely, first with the wire to probe the key contacts, then after making a sufficient number of notches on the key template, just with the key itself and the file. It took less than a quarter of an hour to recreate a fully functioning key, no less intricate than my own car’s key. Interested in traveling to Vietnam ? 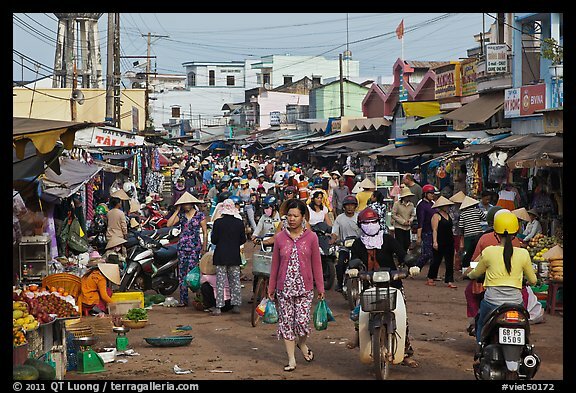 Check the Vietnam photo tour that I will be co-leading in Fall 2012. 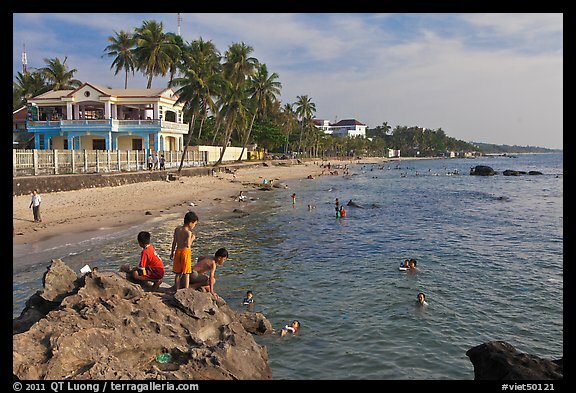 Note that Phu Quoc Island is not included in that itinerary. As nice as it is to visit, I did not find enough interesting sights there. Our itinerary is designed to let you discover some of the most remarkable scenes in Vietnam within a relatively short time. Very interesting pictures as well as the story. I never made it to Vietnam so I’m happy your shared your experience with us – thanks. « Cedar Grove, Kings Canyon National Park – the other Yosemite ?